The Morning Spinal Warm-Up routine is a short 3-5 minute warm up and opener for the spine designed to reduce spinal stiffness, improve spinal flexibility and increase blood flow to the spine. If any of the following movements or stretches aggravate and worsen your spinal condition those movements should be avoided. Only perform the movements you and your spine are comfortable with. Stand with feet hip-width apart and heels turned out to create a straight line with the outside of the feet. Gently rotate your pelvis backwards whilst keeping your knees straight. Open your palms to face forward. Gently tuck your chin bringing your head in line with the shoulders. Breath in lifting the shoulders and then breath out letting your shoulders fall back. This should feel natural, if you are forcing the posture and working too hard you are doing it wrong. Breath in as you raise your arms above you. Clasp your hands behind your head interlocking your fingers. Breath in whilst opening your chest and looking up with the head and moving your elbows back, this should take four slow seconds. Breath out whilst moving your elbows forward and flexing your neck to stretch the back of your neck, this should take 4 slow seconds. Come onto the floor laying on your back. Pull your knees into your chest as you flatten your low back against the floor. Circle 4 times to each direction feeling the massaging of the spinal muscles. Massage side to side 4 times each side. Place your hands behind your knees and roll up to a seated position then sit with your heels under you ready for the next pose. From sitting on your heels walk your hands forward keeping your buttocks on the heels and stretching all the way out with your hands. Hold for 30 seconds. From here walk your outstretched hands over to one side feeling the stretch up one side of your spine and lats. Hold for 15-30 seconds. Repeat on the opposite side. 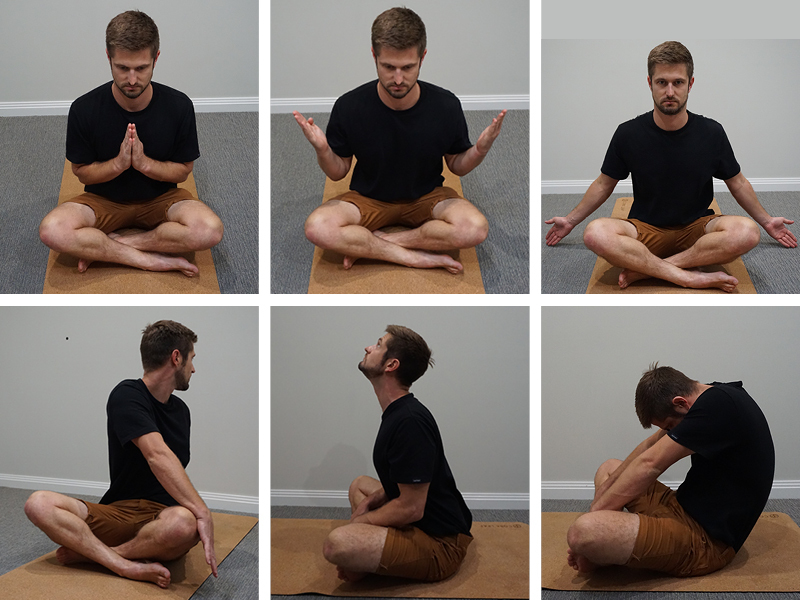 Walk your hands up to a seated cross-legged position. Sit tall bringing your elbows to your sides and pushing the palms together in front of your chest. Roll the shoulders back and tuck the chin slightly, feel the stretch from your lumbar spine to your cervical spine. 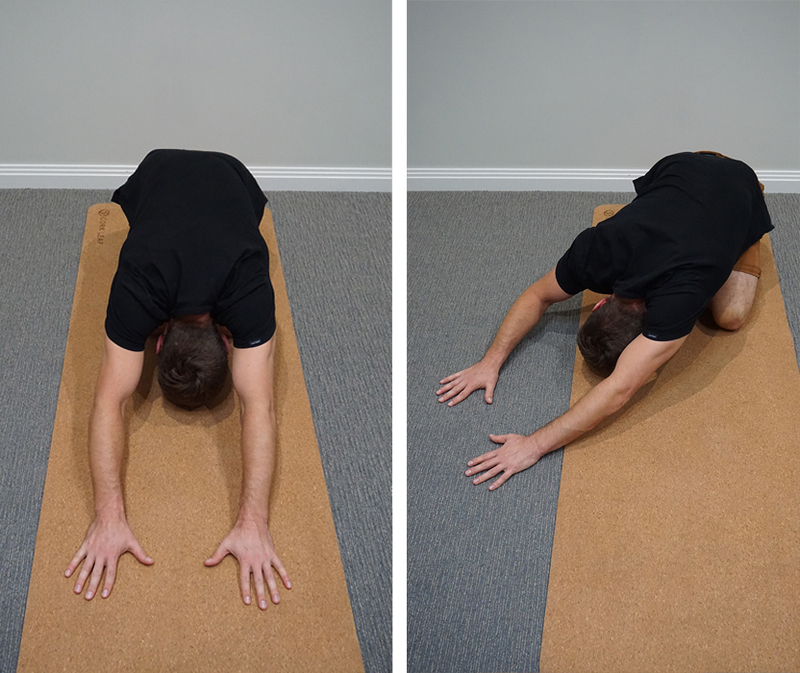 Snake mobilisation – Place hands on the shins using them to pull the chest forwards and extend the spine as your breath in. Breath out as you bow the spine whilst tractioning and pulling on the shins. This movement and transition should be smooth and fluid. Perform this 4-8 times increasing the speed as your spine becomes more mobile. Place one hand on the opposite knee and the other hand behind the spine as you breathe in and gently twist to look behind you. Breath into the stretch, do not force it. Hold for 12 seconds 3 breath cycles. Repeat on the opposite side. Roll forwards onto your knees with hands shoulder-width underneath you in a four-point position ready for the next pose. Create a straight line with your spine all the way from your pelvis to the back of your head pulling in the stomach muscles setting your posture. 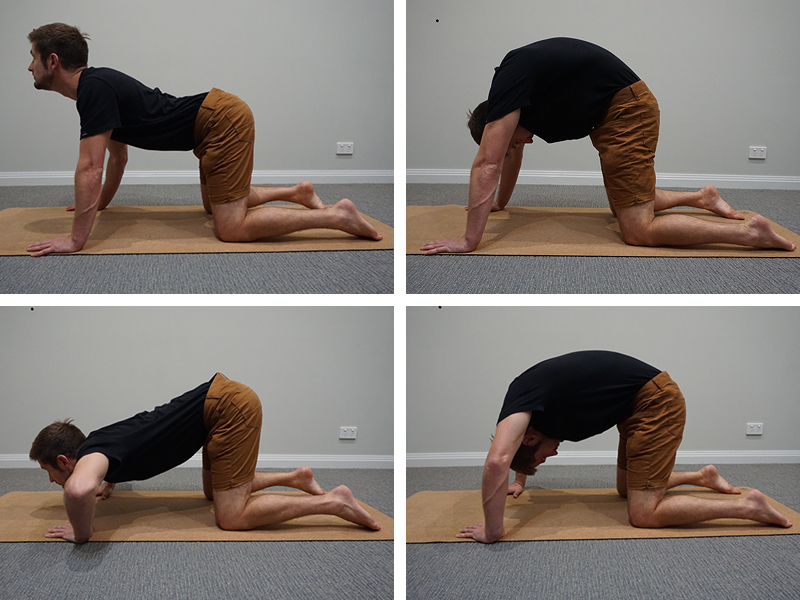 Breath in as you let your lumbar spine fall and extend whilst you pull your shoulders back and down towards your pelvis. Look up and extend the neck. Reverse this by flexing the lumbar spine, flexing the neck and pushing your shoulders up towards the head and away from each other whilst breathing out. Repeat this in a fluid flowing motion 4 times. Progress to a dynamic cat/camel by bending the elbows and lowering the chest towards the floor bringing your body weight forward. 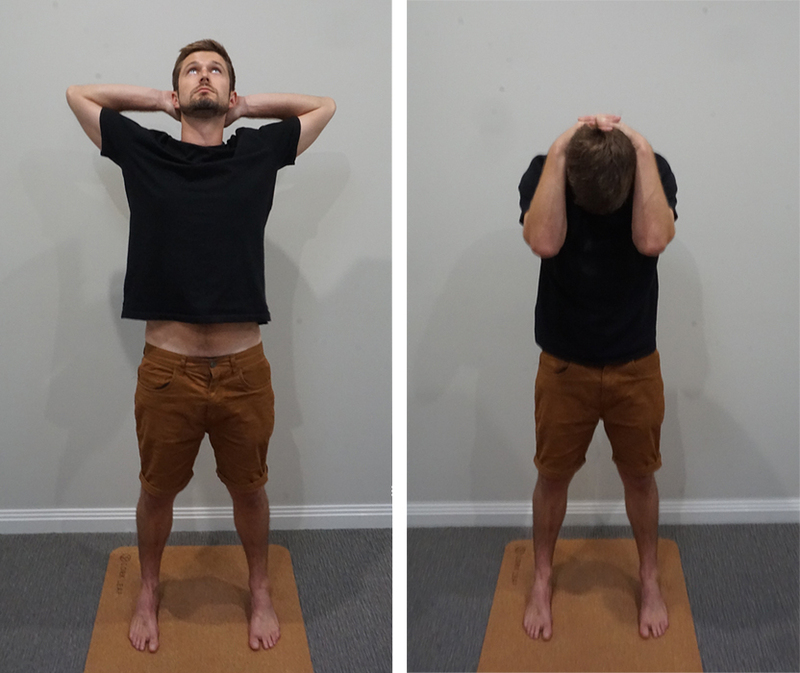 Extend your neck, pull your shoulders back and down towards the pelvis and extend the lumbar spine. Reverse this pose by breathing out as you bend your elbows and flex the lumbar spine forward and bend the spine into a bow shape. Repeat this in a smooth flowing manner 4-8 times. 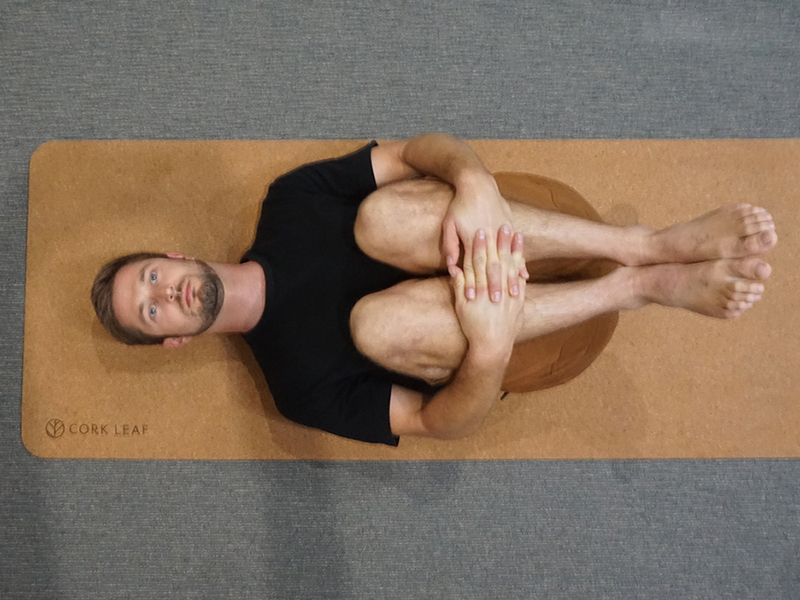 With your toes on the floor sit your buttocks on your heels with your palms flat on the floor and shoulder width in front of you about 30cm in front of your shoulders. As you push away with your palms against the floor lift your buttocks into the air without fully straightening the legs. One foot at a time push the heel into the floor as you fully extend and straighten the legs and lift the pelvis even higher to create a straight line from your pelvis through your upper back and neck. Don’t worry if you can’t straighten your legs or push your heels into the floor, just feel the stretch in the backs of the legs, low back and shoulders. Breathe deeply as you hold for up to 30 seconds. 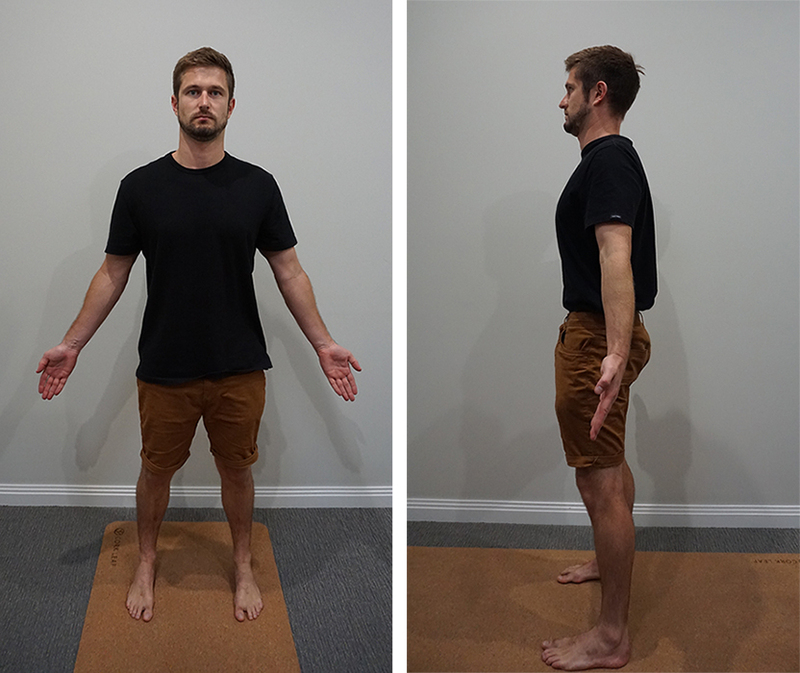 Walk your hands back to your feet as you rise to stand and come back to Mountain Pose the first postural resetting move of the series. This simple spinal warm up will get the blood flowing, stretch and lengthen tightened ligaments of the spine and relieve tension so you can be ready for the busy day ahead. Modify this sequence to suit your body. Do not push to feel pain, in time your body will grow into the moves and become more supple and fluid.